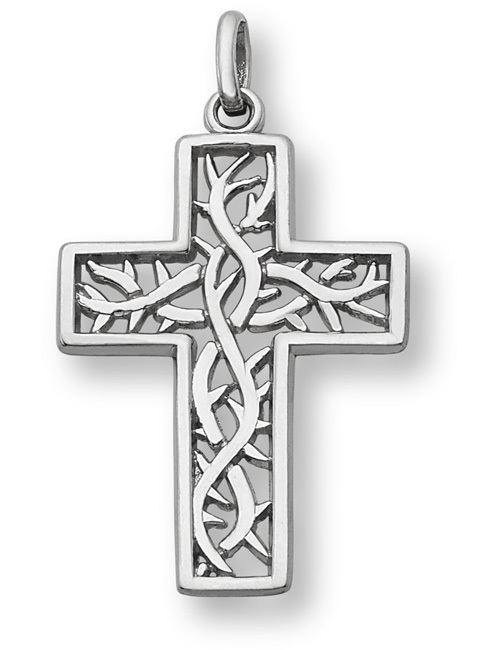 A .925 sterling silver cross necklace pendant with a crown of thorns design inside the cross. The crown of thorns cross measures approximately 1 1/6" tall x 3/4" wide (or 1 5/16" tall with the hoop/bale). This pendant is also available in 14k white or yellow gold, shown below. "And the soldiers platted a crown of thorns, and put it on his head, and they put on him a purple robe ..." (John 19:2). Add a sterling silver box chain to make it a crown of thorns cross necklace, in either 18" or 20" (optional). This pendant is made in the U.S.A.! We guarantee our Crown of Thorns Cross Necklace in Sterling Silver to be high quality, authentic jewelry, as described above.